One of the most common uses for Mass Finishing’s centrifugal barrel finishing and other tumbling equipment is for the medical device industry. Mass Finishing has hundreds of customers using our equipment for smoothing out the critical surfaces of precision medical parts. 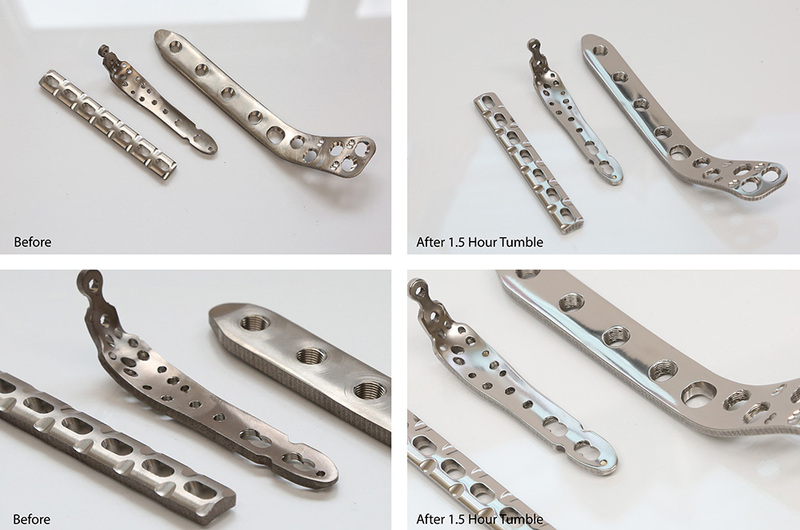 From surgical tools and equipment to replacement knee and hip parts, Mass Finishing has decades of experience removing machine lines, breaking sharp edges and adding a mirror finish to these highly sensitive parts. Our equipment eliminates handwork and will allow you to implement a process that is efficient and repeatable. Achieving the finish you desire varies greatly by the raw condition of the part. For rough parts with heavy machine lines or scale from heat treating and other strengthening processes, it can take up to two hours to reach the final surface requirement. Simple deburring or edge radiusing of parts can take 10 to 20 minutes. Mass Finishing uses a combination of tumbling media to first grind and smooth out the surface and then a final step media to add a high shine or polish to parts. MFI stocks media and it is available to purchase on our web store. The equipment MFI recommends for these applications greatly depends on the size of the part and the production volume of the manufacturer. Our entry level centrifugal barrel finishing machine, the HZ-40, can handle parts that are roughly ten inches long by four inches in diameter. It has four removable barrels which can be customized for the application. For larger production volumes and part sizes, our HZ-60 and HZ-120 are good starting points. Many of our clients use multiple machines to handle the separate steps, when production efficiency is a must. I am from INDIA, working for an Electroplating firm, we are looking for some media and compound to get shiny finish on Surgical (medical) tools from the raw finish of machining and heat treatment scales. Please suggest me the Media and how to get it from you with BEST prices? I’ve sent you an email. Please check. Thank you!